Labeled as an automaker that produces cheap cars for many decades, Hyundai has improved its brand reputation tremendously in recent years — thanks to automobiles such as the Genesis and the Equus. In 2015, after some six years of testing the premium segment with the aforementioned sedans, the Korean company has finally decided to enter the luxury segment with a dedicated brand. The said brand will go by the name Genesis and will include both the Genesis and the Equus nameplates, albeit under a new alphanumeric naming structure that will include the letter "G." The new division will be aimed toward similar products from Toyota’s Lexus and Nissan’s Infiniti arms. The first automobile to be launched under the new brand will be named the Genesis G90 in North America and the Genesis EQ900 in South Korea. Described as the brand’s new flagship model, the G90 just broke cover in South Korea in December 2015, only a month after Hyundai announced the founding of the Genesis division. At the 2016 Detroit Auto Show, the G90 made its North American debut. 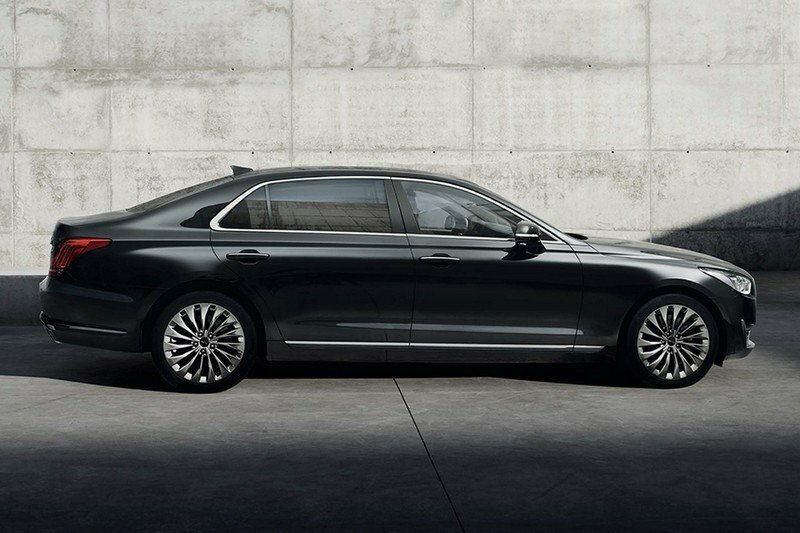 “Genesis’ new large luxury sedan G90 will deliver a concept of ‘New Luxury’ to our customers. 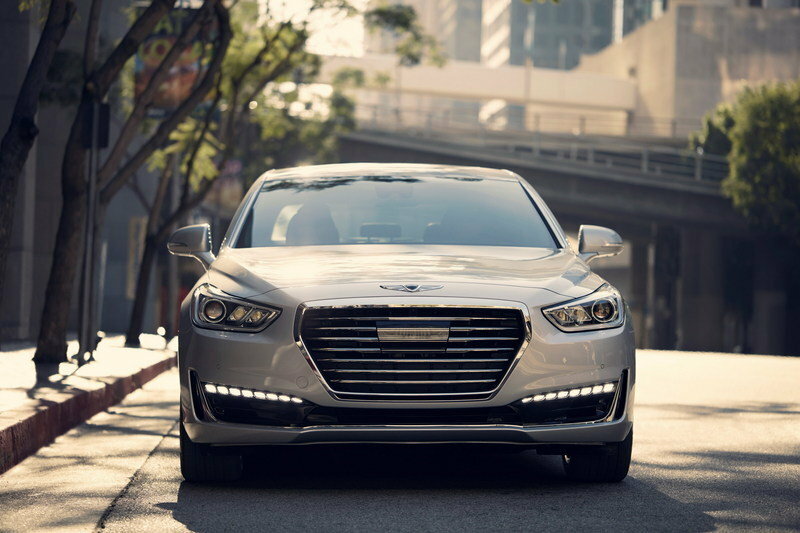 The G90 sits at the pinnacle of the Genesis brand and demonstrates how we apply our human-centered values to give our customers true satisfaction in every aspect of the vehicle ownership experience,” said Woong-Chul Yang, Head of Hyundai Motor R&D Center. Updated 09/05/2016: Genesis announced prices for the new G90 which will be put on sale at the end of this month. Check the "Prices" section for the full details. Continue reading to learn more about the 2017 Genesis G90. 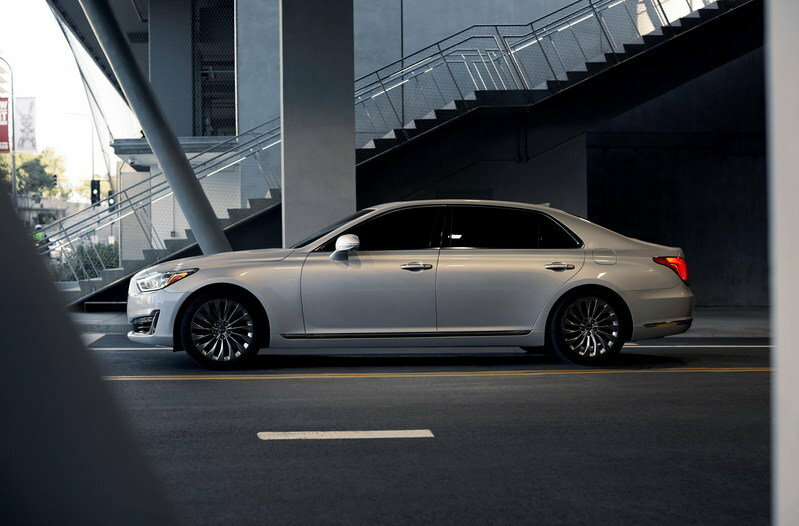 Styling-wise, the Genesis G90 introduces a new design language called "Athletic Elegance." 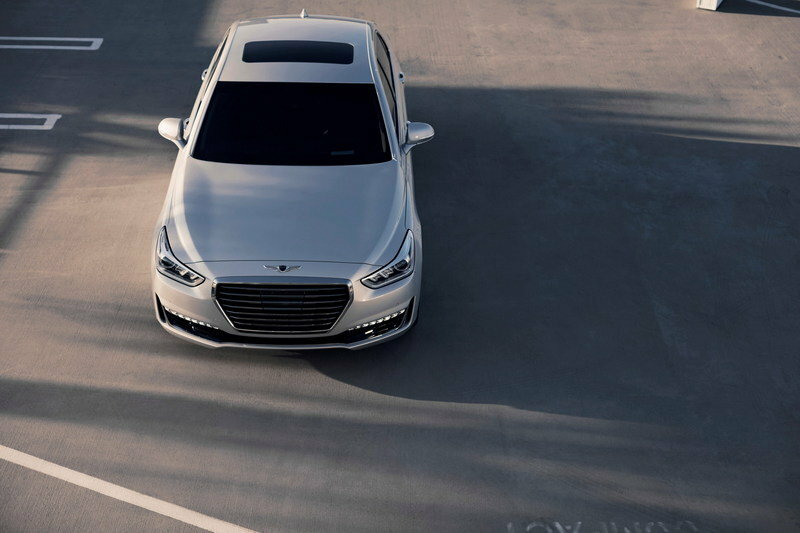 The sedan was penned by the newly-founded Prestige Design Division, which promises to expand the design to the five new Genesis-branded models scheduled to arrive by the end of the decade. Fancy PR talk aside, the G90 is indeed an elegant and athletic sedan. Significantly more elegant than the large, but rather dull-looking Equus, the G90 is also very sporty for a vehicle of its size. 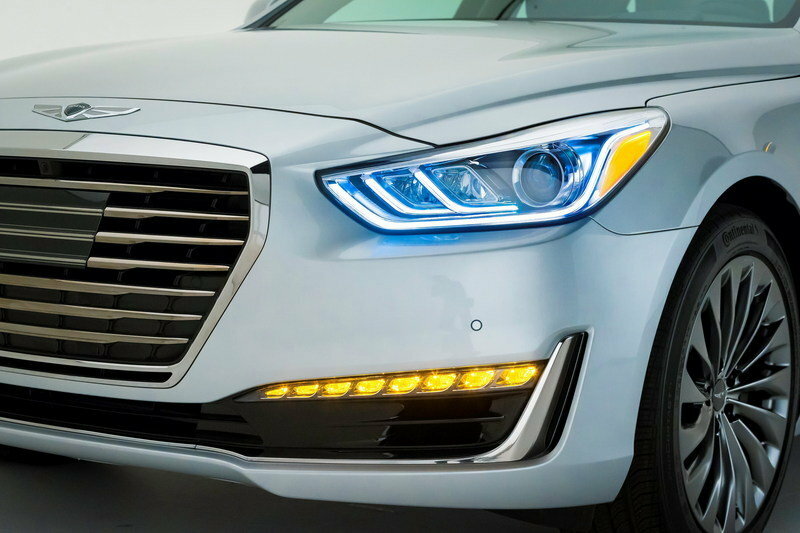 The front fascia received a crisper version of the Genesis’ massive grille and similar daytime running lights, but everything else was reshaped to give the sedan an exquisite appearance. There are LED headlamps that extend into the fenders, an imposing chrome insert into the muscular bumper, and a wing-type badge above the grille. The long hood seems to retain the Genesis’ clean lines. The car’s profile is unlike anything else Hyundai has designed to date. 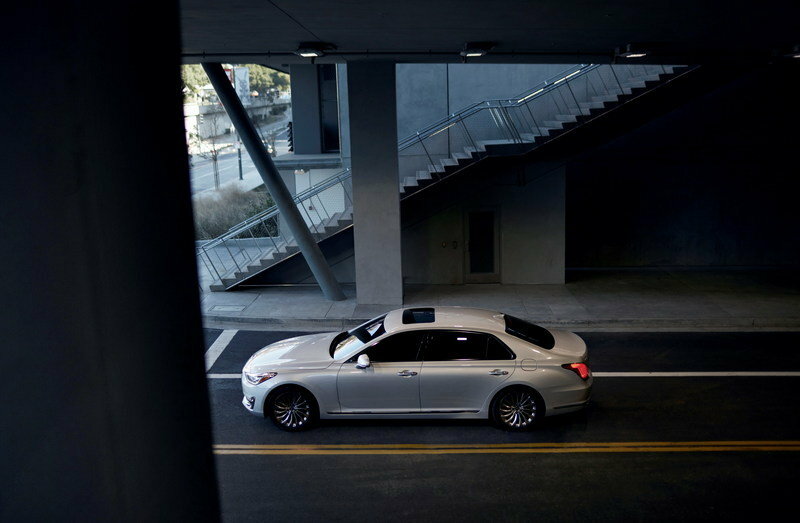 The G90 has a tall shoulder line, muscular rear haunches, large wheels, and a large glass area for the rear doors. The steeply raked rear windscreen, short rear deck, and the vertical taillights that extend into the fenders give it a unique look in the luxury segment. Although it feels as massive as a Bentley Flying Spur, the G90 is incredibly sporty and elegant for a Hyundai. As far as dimensions go, the G90 is 1.7 inches longer and 0.6 inch wider than the Equus. While the new sedan is not significantly larger than its predecessor, its wheelbase is no fewer than 4.5 inches longer, which speaks volumes of Hyundai’s efforts to improve comfort and roominess. Much like the exterior, the interior is also a significant departure from the Equus. Although the latter was pretty luxurious for a Hyundai, it was no match for most of its competitors in terms of soft-touch materials, craftsmanship, fit and finish. The G90 appears to have fixed that with a redesigned cabin that features human-centered ergonomics, improved materials, and an elegant color palette. The new design brings together Italian and Nappa leather, rear wood trim, contrast stitching, and polished aluminum inserts. The cabin also feels a lot more modern compared to the Equus, which looked dated even when compared to the previous-generation S-Class. The new design brings together Italian and Nappa leather, rear wood trim, contrast stitching, and polished aluminum inserts. The latter are spread throughout the dashboard, center console, and upper door panels. Overall, the cabin looks like a plush and fancy place to spend time, and if it weren’t for the Genesis badge on the steering wheel, you wouldn’t know you’re sitting in a Korean car. The newly-developed seats are certified by German back specialists and come with 22-way power adjustment for the driver and 14-way setting for the passengers. The vehicle is also equipped with a Smart Posture Caring system that positions the seat, steering wheel, head-up display, and side mirrors to the driver’s optimal position. 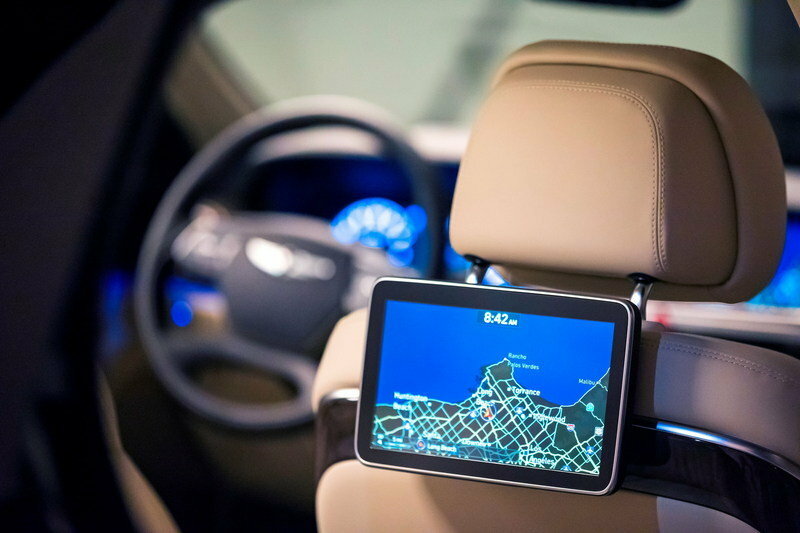 High-end tech includes a 12.3-inch touchscreen (as large as Mercedes’ unit), a new parking camera, and 360-degree monitor among many other features. A Lexicon surround sound system promises to provide a hi-fidelity listening experience. This is also possible due to extensive efforts Hyundai has made toward reducing NVH (noise, vibration and harshness) levels, by using special sound-absorbing materials, laminated glass for each window, and an optimized suspension setup for high-speed cruising with minimum body vibration. The automaker claims that the G90 boasts best-in-class ratings for in-cabin quietness, but we won’t find if this is true or not until the sedan is tested against its main competitors. Motivation for the G90 comes from two gasoline engines. The base model uses a twin-turbo, 3.3-liter V-6 rated at 365 horsepower and 376 pound-feet of torque, while the range-topping version features a 5.0-liter V-8 that cranks out 420 horses and 383 pound-feet of twist. Both units benefit from Hyundai’s second-generation, eight-speed automatic transmission with reduced clutch-disc drag, lighter converter components, and reduced losses from lower oil pump displacement. The new gearbox is 18 pounds lighter that its predecessor and boasts higher efficiency and more compact dimensions. 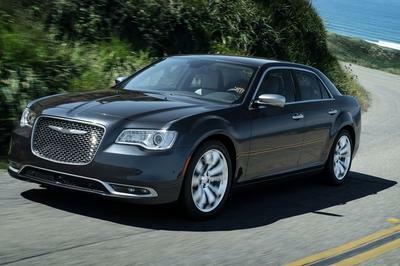 In other markets, the base G90 gets a naturally aspirated, 3.8-liter V-6 rated at 315 PS (311 horsepower). 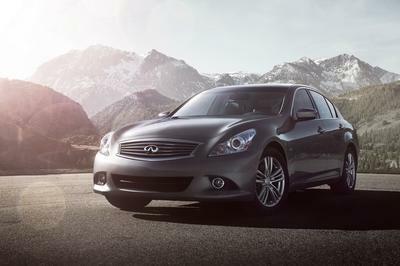 The unit is similar to the one offered with the Equus in Asia, but it delivers an extra 25 PS (25 horses). A hybrid drivetrain should also be on the table, but it will probably be offered later in the sedan’s life cycle. An new all-wheel drive system is available for either drivetrain. Hyundai’s H-TRAC system can direct up to 40 percent of the available torque to the front axle for enhanced traction in adverse road conditions such as ice or snow. In dry road conditions, its Sport calibration uses a high degree or rear-drive bias for sportier cornering and acceleration, sending up to 90 percent of the available torque to the rear axle. When Economy mode is activated, up to 100 percent of the torque is distributed to the rear wheels for maximum efficiency. Hyundai brags about the Genesis G90 featuring "several world-best safety technologies" and the strongest body frame in the full-size class. Details are scant at this point, but the Koreans did list Autonomous Emergency Braking with Pedestrian Detection, Active Blind Spot Detection, Driver Attention Alert, Smart High Beam Assist, and an Around View Monitor among the sedan’s safety features. Pricing for the G90 starts from $68,100 in the U.S. That’s a $6,600 premium over the Equus model it replaces, but the difference is far from shocking given the massive improvements in just about any department. For $68,100, you get the 3.3-liter V-6 engine with rear-wheel drive, while the optional AWD system increases the sticker to $70,600. Models equipped with the 5.0-liter V-8 powerplant retail from $69,700 with rear-wheel drive and from $72,200 with all-wheel drive. These rices are pretty in line with those of the competition, but the base model is actually more affordable than what you pay for a Lexus LS. 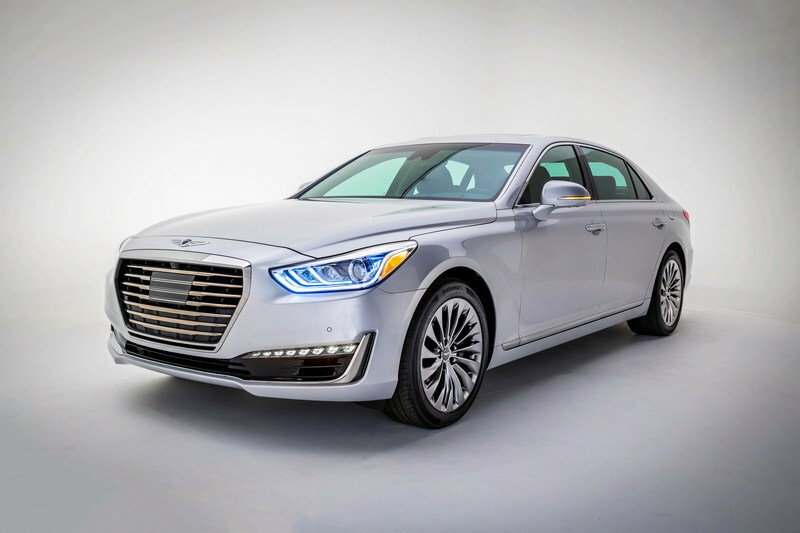 While Genesis’ long-term plan may include stealing customers from BMW, Mercedes-Benz, and Audi, taking on the Lexus LS should be the G90’s first step in the U.S. market. Launched in 1989 as one of the first Asian full-size luxury sedans to cross the pond to the U.S., the LS is now in its fourth generation. Revised for 2014, the current LS features the brand’s revised spindle grille and more aggressive styling cues, while the interior comes with standard heated and ventilated front seats and attractive color combos. 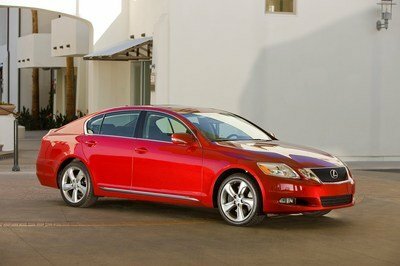 Power is provided by either a 4.6-liter V-8 rated at 386 horsepower or a hybrid drivetrain generating 438 horses. Pricing starts from $72,520 for the V-8 and $120,440 for the hybrid. 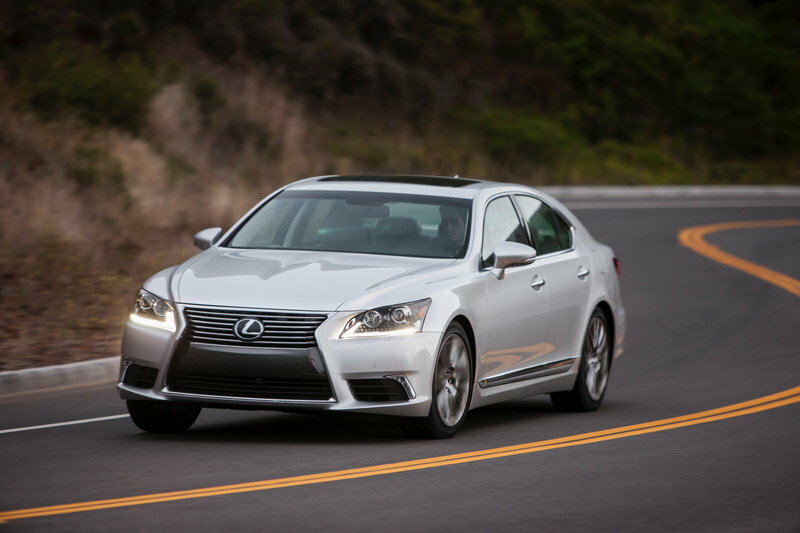 Read more about the Lexus LS here. 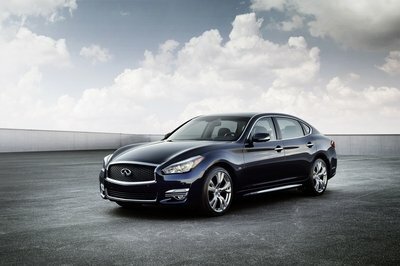 Genesis’ other main competitor, Infiniti, has yet to produce a full-size as of 2015, with its largest sedan being the Q70. 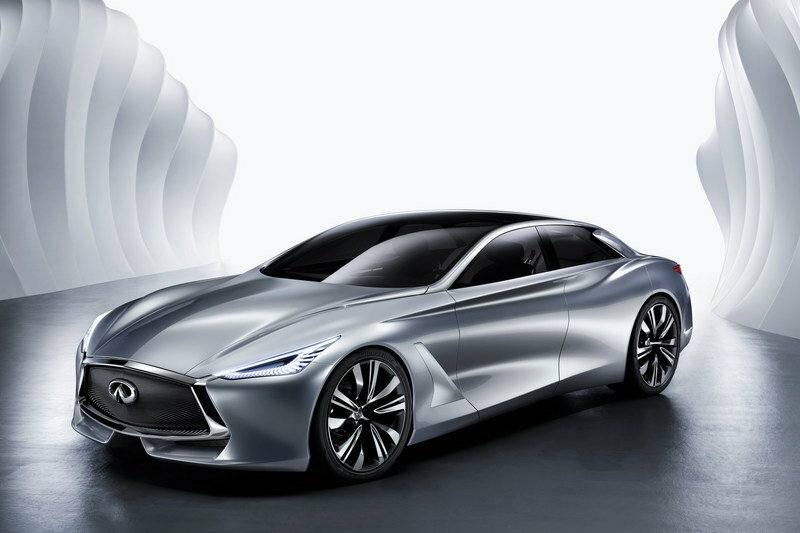 Nissan’s luxury division, however, plans to launch a production version of the Q80 Inspiration, which will become the brand’s flagship vehicle. Very little is known about the production model as of this writing, but much like the Genesis G90, the Q80 should also features a new design language and Infiniti’s latest tech and safety systems. Power is expected to come from a 5.6-liter V-8 and a hybrid drivetrain that will combine a 3.5-liter V-6 and an electric motor. The new sedan should fetch in excess of $70,000 in the U.S.
Find out more about the Infiniti Q80 Inspiration here. It’s hard to draw a conclusion without being able to jump behind the wheel for an actual test drive, but the upcoming Genesis G90 looks good so far. Hyundai already made a big step toward the luxury segment with the Equus, but its plain styling, modest low-end torque, and inferior driving experience prevented it from becoming a worthy competitor to the Lexus LS. That too changes with the Genesis G90, which looks to be a improvement in just about every department and delivers more luxury than any other Hyundai before it. We won’t know for sure if it has what it takes to give the German full-size sedans a run for their money until it hits dealerships, but the G90 might just become the first Hyundai product you won’t have to justify paying more than $60,000 for. 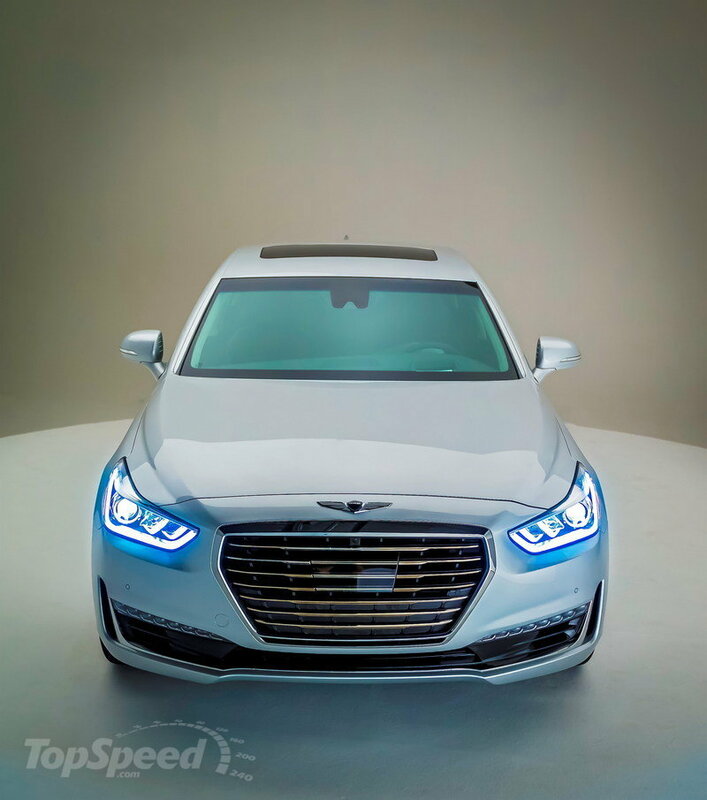 Updated 01/12/2015: The new Genesis G90 made its North American debut at the 2016 Detroit Auto Show. Updated 12/10/2015: After dropping the official details and images, Genesis also revealed a first video for its latest G90. Check it out to see how the G90 was completed with innovative design and perfect proportion. 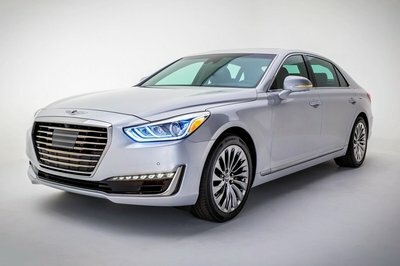 Hyundai Motor Company today unveiled its G90 premium luxury sedan for the Genesis brand in the U.S. market, the new flagship of the brand’s model line-up. The 2017 G90 will compete at the top of the premium luxury car segment with world-class technological innovations and the highest levels of refinement, convenience and dynamic performance. Created by the new Prestige Design Group, G90 provides strong indications of the brand’s ‘Athletic Elegance’ design identity that will be evident in future Genesis products. The G90 silhouette is both powerful and refined, from its prominent hood, generous wheelbase, minimized overhangs and sophisticated rear deck surfacing. Inside the cabin, fine materials and textures from around the world meet refined ergonomics to provide occupants with absolute convenience and luxurious comfort. With advanced technological innovation at its core, G90 features GENESIS SMART SENSE, a suite of driver safety technologies. These features cover the full spectrum of active and passive safety, from driver alertness and focus to total occupant safety, and even the safety of other drivers around you. This suite brings together systems such as Automatic Emergency Braking with Pedestrian Detection, Smart Cruise Control with Stop/Start, Smart Blind Spot Detection and Lane Keep Assist. 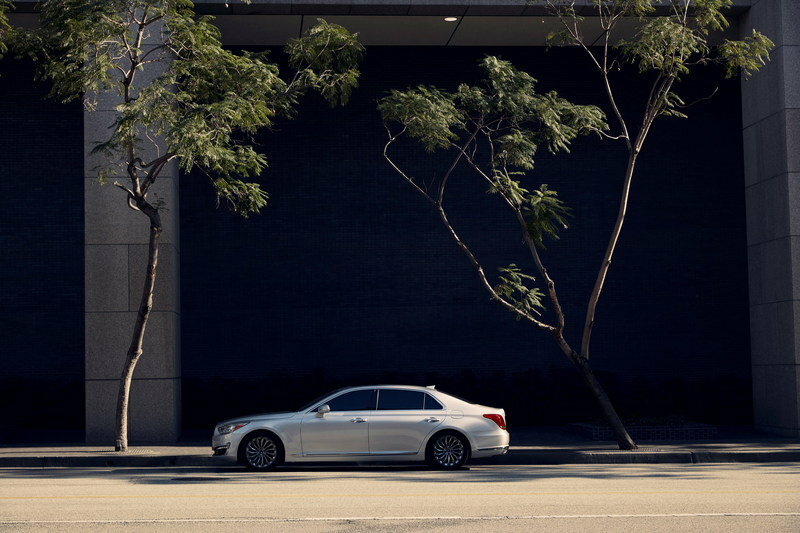 G90’s Automatic Emergency Braking (AEB), utilizing sensor fusion technology to help avoid a potential collision or reduce its impact. With this system, G90 will employ automatic braking when it detects another vehicle or pedestrian at an unsafe closing rate of speed. This system uses the front radar from the Smart Cruise Control system and the forward camera from the Lane Keep Assist (LKA) to provide this extra margin of safety. Benefitting from an intensive four-year development focus by an 800-strong team, the G90 offers best-in-class NVH refinement levels. Every detail of the interior has been crafted to enhance the passengers’ sense of luxury. Advanced ergonomic analysis dictates the positioning of driver controls, passenger comfort and entertainment features, while exclusive materials are sourced from the finest artisans around the world. For optimized comfort, Genesis offers an impressive 22-way power driver seat. Vehicle dynamics, including ride comfort and road holding in adverse conditions, are optimized by combining an advanced H-TRAC all-wheel-drive system with the first application of Genesis Adaptive Control Suspension (GACS). G90 owners will immediately notice the highest standards of refined performance. These characteristics are central to the Genesis brand, with development teams carrying out rigorous performance testing at the company’s European Technical Center at the Nürburgring in Germany and the California Proving Grounds in the Mojave Desert. Even with this sporty and responsive character, the G90 interior environment remains well-mannered. G90 powertrain options include an all-new 3.3-liter direct-injected, twin-turbocharged V6 or the award-winning Tau 5.0-liter direct-injected V8 for ultimate power. In addition to the United States, G90 will be offered in other markets, including China, Russia and various countries in the Middle East. Five additional Genesis models are planned for launch within the next five years. 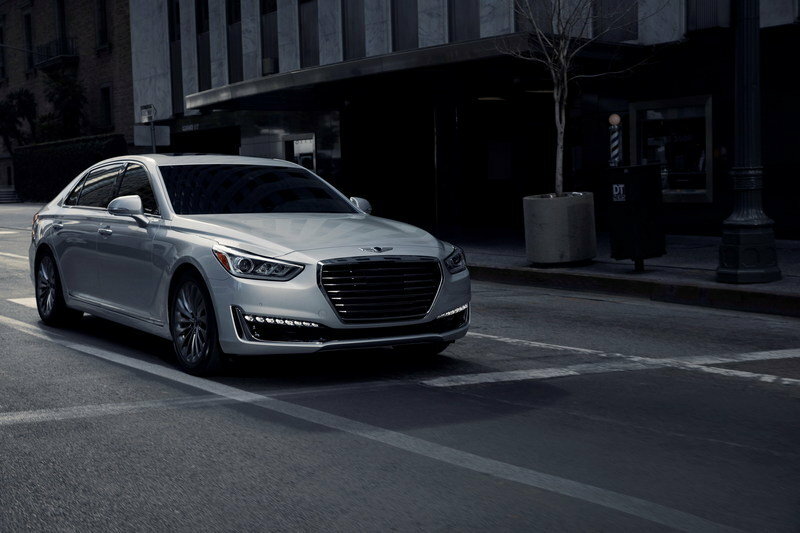 Led by key design members of Hyundai Motor’s new Prestige Design Group, the distinctive appearance of the G90 exudes both confidence and originality. Under the oversight of Chief Design Officer Peter Schreyer, G90 expresses the first interpretation of the Genesis design identity ‘Athletic Elegance,’ which embodies the beauty of energy exploding through masterful control, like the moment when an archer focuses his entire strength and spirit into the tip of an arrow. In crafting the G90, the Prestige Design Group aimed to capture the car’s strength and originality, while presenting fresh appeal through innovative styling and sporting proportions. From the front perspective, the G90 identity is conveyed through a Genesis-family design feature, the ‘CREST’ grille, and crowned with the winged Genesis emblem. Perfectly proportioned, the G90 combines a prominent hood with short overhangs, an unequivocal manifestation of its performance rear-drive architecture. 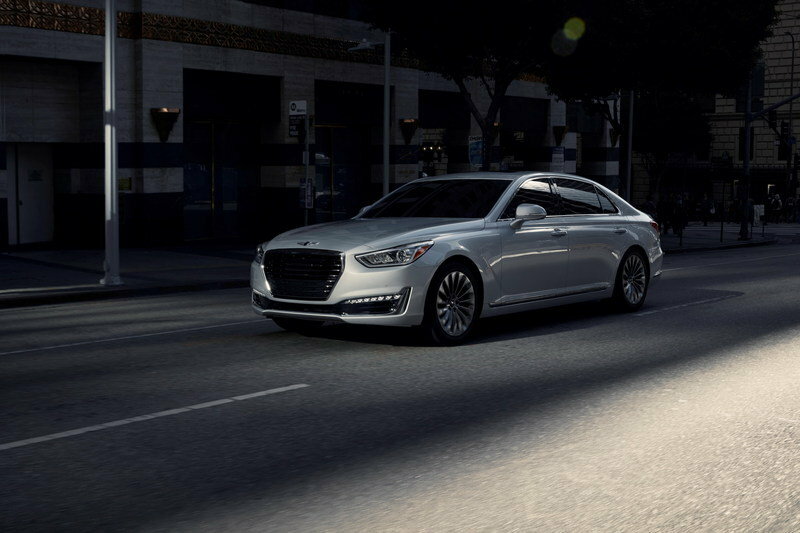 Available full-LED signature headlights (V8 model) flow from fascia to fender – a key design element of the new Genesis brand. On the lower fascia, standard LED Daytime Running Lights (DRLs) add to the distinctive illumination signature. The unique G90 grille design also supports a bold and confident front visage. From front to rear, a bold, arcing character line spans the length of G90, accentuating the vehicle’s dynamic profile. Refined use of chrome elements also serve to create an elegant and premium appearance. From the rear, dual asymmetrical exhaust tips surrounded by lower fascia accents provide a substantial reminder of available power. 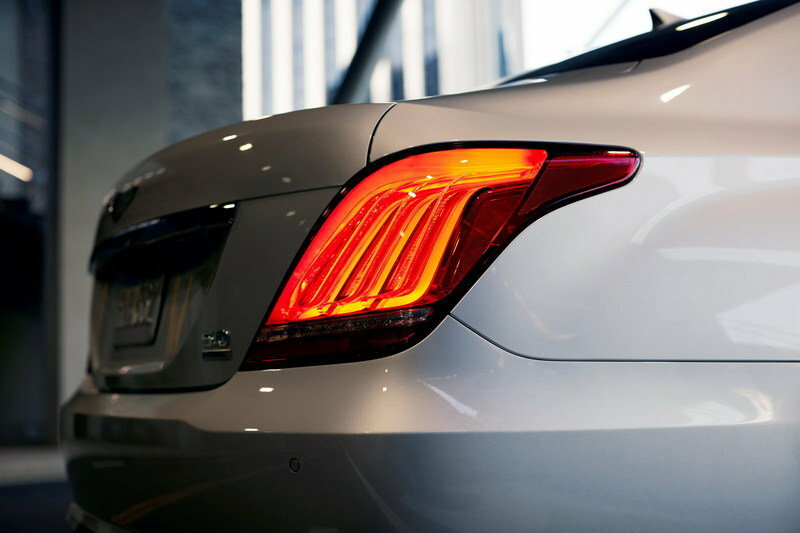 Vertical full LED light signature elements provide a unique rear illumination signature. Even more, the clean lines of the G90 yield the additional benefit of an exceptional 0.27 Cd for minimized wind noise and enhanced fuel efficiency, a best-in-class for the segment. With luxurious interior spaciousness, the G90 is available in five colors created to accentuate its distinctive lines. Ranging from Casablanca White and Caspian Black to Manhattan Brown, Santiago Silver and London Gray, the color palette was painstakingly matched to a wide spectrum of interior environments and sophisticated material selections. Effortless ergonomics, interior design harmony, convenience and luxurious comfort helped craft the G90 interior design. From the horizontal and graceful layout of driver controls and genuine, premium material selection, to meticulous craftsmanship, precision Nappa leather-stitched instrument panel and an elegant material color palette, virtually every element of the interior focuses on the passengers. Extensive consideration has been given to material selection for the G90. The highest-quality, authentic materials adorn the cabin, with ease of operation and intrinsic beauty as fundamental priorities for the interior. Throughout the cabin, the controls for these latest technologies are luxuriously ensconsed amid Nappa leather and genuine wood accents, delighting the senses and cosseting the occupants in a first-class ambience. Even the Lexicon® audio speaker grilles convey an ultra- luxury ambience, precision-machined of high-grade aluminum alloy. Passenger space is a key component of interior comfort and design, and the new G90 has significantly improved spaciousness, derived in part from a generous 4.5-inch increase in wheelbase for greater passenger comfort. This increase in wheelbase also resulted in reduced overall overhangs when compared with the previous model. Inside the cabin, this translates to superior front headroom (41.1 inches) and legroom (46.3 inches) compared with key competitors. Tuned for maximizing driving confidence, a rigorous engine testing regime focused on overall responsiveness, while retaining luxury-class refinement levels. G90 is fitted with a choice of two gasoline engines: a 3.3-liter direct-injected, twin-turbocharged V6 engine developing an estimated 365 horsepower @ 6,000 rpm (with optional premium fuel), or the top-trim 5.0-liter direct-injected V8 engine developing an estimated 420 horsepower @ 6,000 rpm (with optional premium fuel). With either powertrain, G90 boasts impressive performance characteristics even while offering exceptional passenger comfort, a hallmark of the Genesis brand. The 420 horsepower V8 powerplant develops an estimated 383 lb.-ft. @ 5,000 rpm (with optional premium fuel). Hyundai Motor’s first twin-turbocharged engine, the all-new 3.3L direct-injected twin-turbocharged V6, also boasts strong performance with an estimated 376 lb.-ft. of torque throughout a wide RPM range of 1,300 - 4,500 rpm (with optional premium fuel). Both G90 powerplants employ electric thermostats and mid-position-lock Continuously Variable Valve Timing for enhanced responsiveness and fuel efficiency. Further, both engines benefit from an advanced 2nd-generation 8-speed automatic transmission with extensive lightweighting, reduced clutch-disc drag, lighter torque-converter components and reduced losses from lower oil pump displacement compared with the previous generation. This new transmission boasts lower overall weight (18 lbs. lighter), higher efficiency and more compact dimensions as well. A fundamental brand characteristic of all Genesis models is the careful melding of sporty agility and refined performance. At the pinnacle of the Genesis line, G90 achieves these often competing goals via an extensive research, development and testing regime. G90’s engineers worked closely with the company’s European Test Centre based at Germany’s demanding Nürburgring circuit, and also put the car through its paces in controlled environments at the company’s Namyang R&D Center and California Proving Grounds in the Mojave Desert. Through an intensive program of testing and development, the engineering team refined G90 ride, handling, steering feel and suspension damping to deliver an exhilarating driving experience with overall dynamics that are simultaneously luxurious, sporty and refined. G90 also features Intelligent Drive Mode with four distinct driving settings: Eco, Smart, Sport, and Individual (driver-specified parameters). 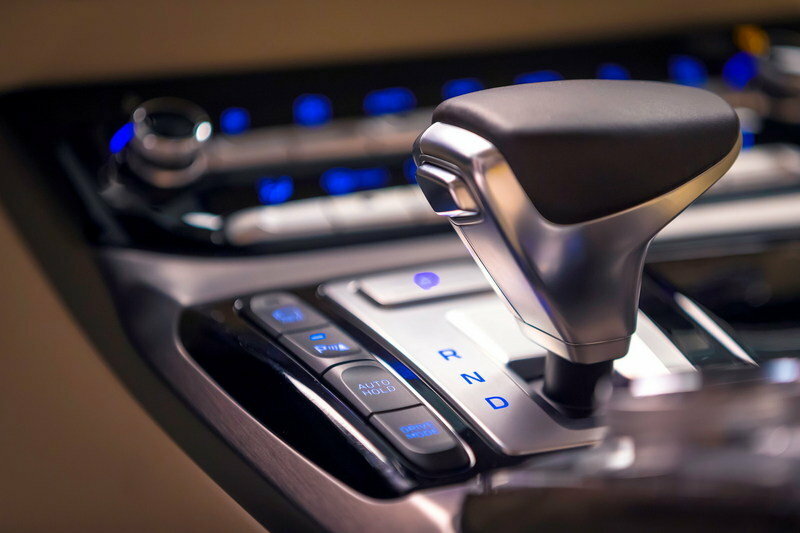 These four driver-selectable modes provide unique calibration settings for suspension, steering, stability control, engine, transmission and available AWD, allowing the driver to determine G90 driving character based on personal driving preferences, road quality, or traffic conditions. Further, G90 includes proprietary “Smart Shift and Drive Control” automatic transmission technology that analyzes driving style and adjusts shift character, engine torque response and suspension damping in real-time driving conditions. As a foundation for better handling precision, G90 body rigidity has been increased, with an overall bending rigidity six-percent higher than the Mercedes-Benz S550. To achieve this impressive rigidity, G90 utilizes 52 percent Advanced High Strength Steel (AHSS), a full 300 percent more than the previous generation, along with more than 650 feet of advanced structural adhesives. 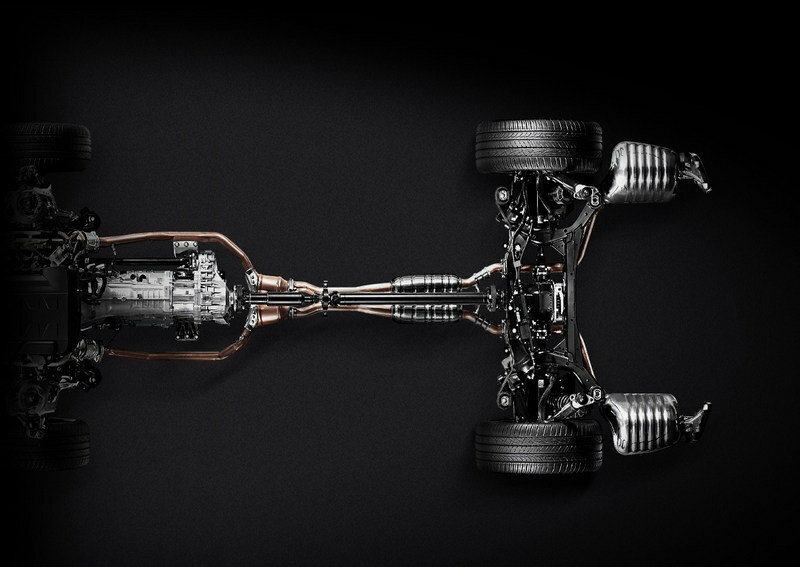 To achieve the smoothest possible ride comfort while retaining engaging dynamics, G90 is fitted with a multi-link suspension design for minimized camber and toe changes throughout the suspension travel range. Rear cross member bushings were also improved from a rubber to a hydro construction. In addition, the Genesis Adaptive Control Suspension (GACS) with electronic damping control smoothly and precisely controls body motions throughout the range of dynamics with minimal compromises to ride comfort. This adaptive control suspension, sourced from Sachs/ZF®, offers independent damping control for both rebound and compression strokes of suspension travel for improved body and yaw control. G90 motor-driven power steering was further refined with optimized assist-and-recovery calibrations and increased steering torsion bar rigidity for more precise steering responsiveness. Large, 19-inch turbine-blade design alloy wheels with 245/45R19 front and 275/40R19 rear performance tires ensure immediate response to steering inputs and precise handling character. An advanced H-TRAC® AWD system is available with either powertrain, for confident control under adverse driving conditions such as ice or snow. This system features an electronic transfer case with active torque control and offers dual-mode Sport or Normal calibrations that are linked to the Intelligent Drive Mode. The H-TRAC system can direct up to 40 percent of available torque to the front axle, for enhanced traction in adverse conditions such as ice or snow. In more ideal conditions, the H-TRAC Sport calibration features a high degree of rear-drive bias for sportier cornering and acceleration characteristics, with up to 90 percent of available torque distributed to the rear axle. In addition, with the H-TRAC systems’ Economy mode, up to 100 percent of available torque is distributed to the rear wheels for maximum driveline efficiency. G90 brakes were also improved for greater fade resistance with larger, 14.8 inch rotors (5.0 V8 model) and thicker (34 mm) front rotors, with dedicated cooling vents in the front fascia for enhanced front brake heat dissipation. Rear brake performance was also enhanced with larger, 13.4 inch rotors. G90 brake calipers use a 4-piston fixed design in front and a 2-piston fixed design in the rear. ‘Safety without compromise’ summarizes the passenger-centered philosophy that has directed the development of the G90. Its world-class safety technologies accompanied by outstanding structural rigidity combine to increase its overall safety quotient. G90 is expected to receive a 5-star safety rating (NHTSA), and a Top Safety Pick+ (IIHS), based on preliminary internal crash tests. All individual crash scenario classifications are expected to receive a Good rating or above. The G90 body structure has been strengthened with a dual-layer member connection design and a newly optimized load-dispersion structure for the small overlap crash test. A variety of class-leading standard safety technologies work to minimize risk and maximize protection for the driver, passenger and other road users. These advanced safety features include: Automatic Emergency Braking (AEB) with Pedestrian Detection, Smart Blind Spot Detection (SBSD), Lane Keep Assist, Rear Cross-traffic Alert, Driver Attention Alert, Dynamic Bending Light headlights with High Beam Assist, and a 360-degree Multi-view Monitor. In addition, G90 also features Smart Cruise Control with Stop/Start capability. For enhanced visibility for the driver, the Head’s-up Display has been increased from 7.4 inches to 9.7 inches with enhanced illumination. Simplicity and intuitive function were key elements in the development of G90 convenience features, delivering the ultimate carefree ownership experience for owners. In developing the car’s specifications and trim levels, every effort was made to provide customers with everything most customers would need without anything unnecessary or overly complicated. Seating comfort was a key development target for G90. Ergo-design seating, including an electronically-controlled, 22-way power driver’s seat including power bolsters, cushion extension and shoulder adjustment, was approved by the German campaign for healthier backs, Aktion Gesunder Rücken. The G90 passenger seat offers 16-way adjustment for optimal comfort. All front seat positions, side mirrors and steering column position are controlled by an integrated memory system. Front seat positions offer both heating and ventilation. The upscale rear outboard passenger seats are electronically-adjustable in 12 ways (14-ways for the right seat position) on the 5.0 V8 model, ensuring the highest levels of comfort. These luxurious seats were carefully developed via thorough analysis of the renowned “Stressless” seat design. In addition, the rear seats offer heat, with ventilation on 5.0 V8 models. The rear seats offer an unusually high comfort level on V8 models, including power: slide linked with recline, shoulder-adjusters, rear lumbar support, 4-way head restraints and a rear integrated memory system controlled by a dedicated rear console selector. 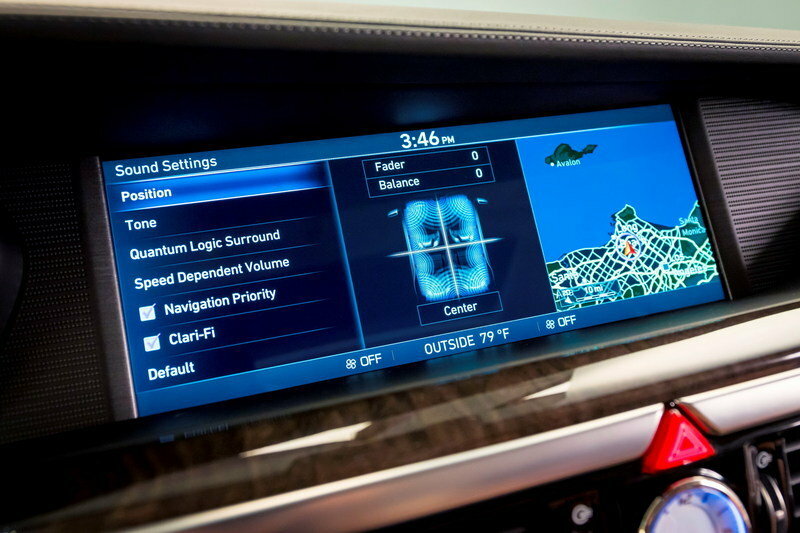 Many of the car’s features rely on interaction with the car’s audio visual system displayed via a luxurious 12.3-inch high-definition widescreen in the center stack, operated via DIS control knob. The screen plays a key role in enhancing the ease of parking and tight urban maneuvering for drivers. A one-megapixel digital camera is activated when parking, simultaneously sharing the screen with a high-resolution 360-degree Multi-view monitor with steering guidelines. A heads-up display helps drivers to find key driving data while keeping their eyes safely on the road ahead. In addition, a seven-inch high-resolution TFT-LCD display enhances data recognition for the driver from the center gauge cluster. Depending on individual taste or mood, one of seven interior ambient lighting mood lamps can be selected, and LED lamps are positioned in the overhead console and cabin lighting positions. From the outside mirrors, Genesis-logo approach lamps are projected on the ground for enhanced visibility while approaching the vehicle. Ultra-high fidelity was an absolute development requirement for the G90 audio system. Presenting a concert-like experience, the Lexicon® Premium Sound System boasts QuantumLogic® Surround sound with 17 speakers and a 10-inch subwoofer. Developed in concert with Grammy Award-winning artists and producers, QuantumLogic® Surround is a revolutionary new audio algorithm that is designed to mimic the acoustics of the original performance and recording space, identifying individual voices and instruments and re-authoring these into a precise multi-channel soundstage. In addition, Clari-Fi® music reconstruction technology rebuilds sonic details typically lost in the compression process for digital music sources, adjusting fine musical nuances based on the overall quality of the audio signal. This helps to further maximize the high-fidelity listening experience with every track. On the 5.0L V8 model, the rear seats feature dual rear monitors with 9.2-inch, segment-first high-definition screens that can be controlled from the rear seat Driver Information System controller. Engineers focused on segment-leading low NVH as a key differentiator for G90, dedicating hundreds of hours to fine-tuning every aspect of noise reduction and comfort enhancement. This obsessive attention to detail has resulted in G90 boasting best-in-class ratings for in-cabin noise levels, a major achievement in this critical area of refinement in the luxury segment. With special sound-absorbing materials throughout the cabin, to the application of specially laminated acoustic film glass on every window, the G90 cabin is a pleasant refuge for its passengers. Road noise was further minimized through the development of a specialized Helmholtz design, with hollow, two-piece wheel construction, and an integral sound absorption chamber for the 19-inch alloy wheels. This design produces an innovative resonance effect which provides sound absorption for reduced tire noise levels in addition to lower overall unsprung weight (7 lbs. lower) for more responsive handling and better ride comfort. Sound engineering also extended to the suspension set-up, optimized at test centers around the world for high-speed cruising, while minimizing cabin noise intrusion and body vibration. Wind noise in the cabin has been reduced through the application of a 3-layer weather-strip seal on all doors. Special double sound-proof glass insulation is now also applied to the rear glass, while carpet and headliner insulation thickness have been increased by more than 20 percent. In the rear quarter panel, a special plate foam pad has been added as a special sound block for rear passengers. For the powertrain, the intake ducting now employs a variable-type valve for minimized intake resonance at various engine speeds. In addition, transmission-housing rigidity has been improved with external rib enhancements and increased thickness leading to reduced NVH. In the engine bay, a special single continuous powertrain seal has been applied for reduced sound penetration into the cabin. Underneath G90, underbody airflow has been improved for reduced turbulence and wind noise, greater efficiency and enhanced stability at higher speeds.